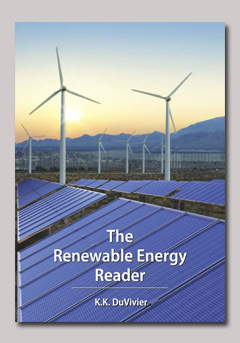 Welcome to The Renewable Energy Reader website! This site supports The Renewable Energy Reader by K.K. DuVivier and published by Carolina Academic Press in 2011 (ISBN 978-1-59460-873-5). While you will need to go to the book for the more in-depth coverage it contains, this website can be your source for materials that should enhance your experience with the book and provide you with useful information about renewable energy resources and renewable energy law. We hope you will explore the site to find the table of contents for the book; a sample chapter; color versions of the book illustrations; links to professional organizations, government agencies, and other websites with valuable data and graphics about renewables; fun renewable energy videos; and more. Read the Table of Contents and Chapter 1 here. Additional Teaching Resources, click here. Professor KK DuVivier’s Faculty Profile page. Disclaimer: Information on this site is provided as a free service and does not purport be current. Laws frequently change and this information should in no way be construed to be legal advice. The authors of this site make no representation that the information contained here is accurate, complete, reliable, or suitable. To ascertain the law in your area consult a local licensed attorney. This web page designed by Phillip Bounds and Marian French.